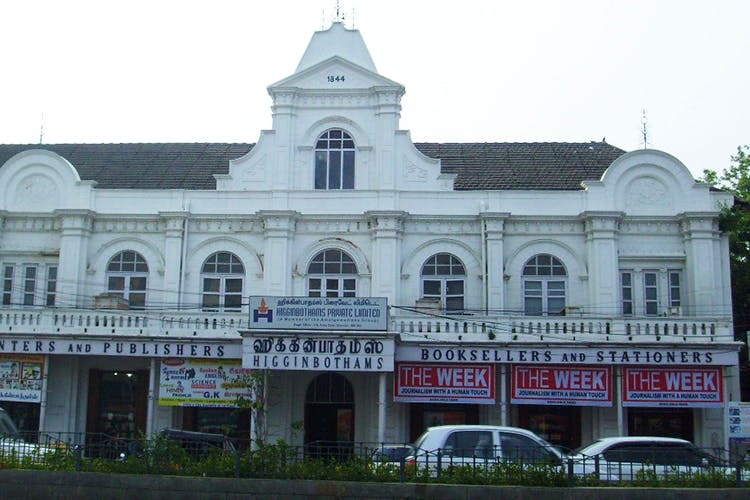 Chennai Peeps, Have You Visited One Of India's Oldest And Most Iconic Bookstores Yet? The true bookworms know just how important Higginbothams is to the city. And for those that don’t, here’s why. Founded in 1844 (that’s right, the bookstore is 173 years old!) by an English librarian by the name of Abel Joshua Higginbotham, the bookstore has become one of the best-known names in the city. Before the likes of Landmark, Starmark and Odyssey came around, if you wanted books, the only place you could get the latest releases and even the oldest editions was Higginbothams. The store on Mount Road was the first bookstore by the company and today it is considered one of India’s oldest bookstores still in existence! Plus, the building is also a heritage structure in the city, which means that while other buildings come change and fall apart around it, the Higginbothams bookstore will never change and never leave that spot. While books were the main focus of the bookstore, they were also selling stationery and by the 1860’s started printing and publishing books under the Higginbotham’s name. And when the British came to India, Higginbothams was appointed as the official booksellers to the Prince of Wales. The bookstore grew, it’s reputation expanded and just before India got her independence, Higginbothams started setting up bookstores within the railway stations. As well as opening their first bookstore in Bangalore (and reopened after two years of renovations this February). Everybody who walked into the Chennai Central was faced with the Higginbothams bookstore and you couldn’t really walk past without peeking in. For years, they had books and magazines in every language, including books for children. At one point, they even started to sell toys for little children when going on train journeys. While the size of the Higginbothams at Chennai Central has reduced, it’s still a familiar place and something of a ‘welcome home’ banner when you alight from the train after a long journey. A recent visit to the Mount Road store showed just that no matter how many other bookstores appear in the city, Higginbothams is not far behind. They still stock the latest books, along with books that you wouldn’t find at other bookstores. They have a large section devoted to Indian writers covering all genres of books. What really catches your eye is the children’s section, where the shelves are overflowing with books for all ages, including the latest in fantasy for young adults. Unlike a lot of bookstores in the city, Higginbothams has a pretty large section devoted to just Tamil writing – whether it be fiction, or non-fiction or just magazines, they have it all. And after the 1989 renovations to retain the original look of the building, the black and white tiled floors really takes you back to Old Madras.